Historic, romantic, spectacular, a proud history charged with emotion, guaranteed to provide life-long memories of your visit. The Highlands of Scotland, a unique and wonderful landscape attracting visitors from all over the world. 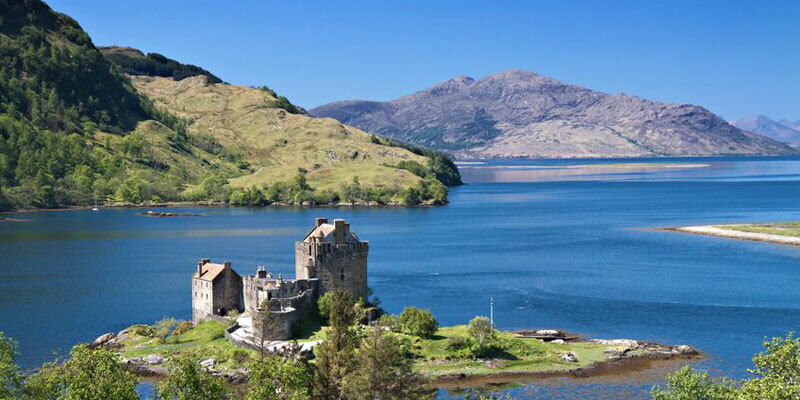 Many parts of the Highlands can be rapidly accessed now with some of the best and most enjoyable roads in Britain making it an ideal destination for a week long holiday or short break. The area is equally well served by the world famous West Highland Railway, and there are numerous airports across the region. Accommodation tends to be less expensive than other areas of Britain, and although the area is vast, there is no shortage of places to stay in even the smallest of villages or hamlets. The standard of accommodation varies too, offering holiday accommodation to suit every budget and taste, from hostelling and budget B&Bs, to small guest house hotels, luxury country house hotels and large golf & spa resorts, as well as camping, caravan sites and self catering chalets, lodges, apartments and cottages for individuals, couples, families, pets and large groups. The area is very popular with visitors seeking the wild, scenic and rugged areas. The Highlands are very mountainous, many of the peaks reaching above 3000 feet, commonly referred to as 'The Munros'. Many walkers and climbers visit the area particularly to climb these Munro mountains. Scotland has 284 Munros. A number of the highest peaks lie in the Cairngorm Mountains and the Grampian Mountains. 12 of them are found on the Isle of Skye. If walking or climbing the mountains is not what you want from a holiday, then there are many beautiful lochs and glens hidden away to explore. Once out of the built-up areas, vast expanses of the glens open up with gently winding rivers rich in trout and salmon. The natural scenery and environment are arguably Scotland's greatest attraction, and many would say that they are some of the best in Europe, There are a vast amount of outdoor activities including conservation projects, areas of special interest dedicated to wildlife, bird-watching, seals, otters, and many more. The Highlands of Scotland are perhaps not renowned for great weather, but as most photographers would agree, this is what makes the Highlands so very special. The light on the water, the shadows on the mountains, the ever-changing light, the magnificent cloud formations, the myriad of colours make the Highlands very special and interestingly unique. Not surprisingly, the Highlands provide the opportunity to make all who visit become great photographers - it is hard to take anything other than great photographs in the Highlands. The magnificent diversity of scenery in the Highlands is matched by the diversity of life, attractions and activities it offers. A fascinating and rich cultural history with much heritage and tradition still an important and active part of daily life, something which visitors to this region are presented with through a range of attractions and sites of interest including historic castles, gardens, whisky distilleries, visitor centres and museums. The Highlands contain world famous sights such as Loch Ness, Ben Nevis, Glen Coe, and the Isle of Skye. As featured in Scotland on Film, the Highlands has drawn directors over the years to a range of dramatic and scenic film locations, and continues to draw its visitors to these unique settings following movies such as ‘Local Hero’ (1983) at Morar, Arisaig on West Coast, as well as many other locations throughout Scotland such as Pennan and the Aberdeenshire coast, ‘Harry Potter and the Chamber of Secrets’ (2002) at the Glenfinnan Viaduct West Highland Line, ‘Highlander’ (1986) at Torridon and Lochalsh, ‘Being Human’ (1993) at Fort William, Glencoe and Sutherland, ‘Loch Ness’ (1996) at Torridon and Loch Ness, ‘Braveheart’ (1995) at Glen Nevis and Glen coe, ‘Rob Roy’ (1995) at Glencoe and The Wicker Man (1973) on Skye to name a few. The only city in this area is the centrally located Inverness, with its airport and excellent road and rail access. In truth, any other region would consider Inverness as little more than a town. It is well worth visiting. The Highland region covers some 30,659 km2, with an administrative HQ in the City of Inverness, the ‘capital of the Highlands’. The political Highland region is slightly smaller than the broad geographically accepted area which includes the Isle of Skye and neighbouring small isles including Canna, Rhum, Muck and Raasay.